"Computer processor" redirects here. For other uses, see Processor (disambiguation). An Intel 80486DX2 CPU, as seen from above. Bottom side of an Intel 80486DX2, showing its pins. The form, design and implementation of CPUs have changed over the course of their history, but their fundamental operation remains almost unchanged. Principal components of a CPU include the arithmetic logic unit (ALU) that performs arithmetic and logic operations, processor registers that supply operands to the ALU and store the results of ALU operations, and a control unit that orchestrates the fetching (from memory) and execution of instructions by directing the coordinated operations of the ALU, registers and other components. The idea of a stored-program computer was already present in the design of J. Presper Eckert and John William Mauchly's ENIAC, but was initially omitted so that it could be finished sooner. On June 30, 1945, before ENIAC was made, mathematician John von Neumann distributed the paper entitled First Draft of a Report on the EDVAC. It was the outline of a stored-program computer that would eventually be completed in August 1949. EDVAC was designed to perform a certain number of instructions (or operations) of various types. Significantly, the programs written for EDVAC were to be stored in high-speed computer memory rather than specified by the physical wiring of the computer. This overcame a severe limitation of ENIAC, which was the considerable time and effort required to reconfigure the computer to perform a new task. With von Neumann's design, the program that EDVAC ran could be changed simply by changing the contents of the memory. EDVAC, however, was not the first stored-program computer; the Manchester Small-Scale Experimental Machine, a small prototype stored-program computer, ran its first program on 21 June 1948 and the Manchester Mark 1 ran its first program during the night of 16–17 June 1949. While von Neumann is most often credited with the design of the stored-program computer because of his design of EDVAC, and the design became known as the von Neumann architecture, others before him, such as Konrad Zuse, had suggested and implemented similar ideas. 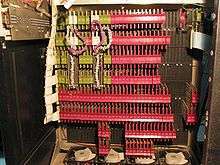 The so-called Harvard architecture of the Harvard Mark I, which was completed before EDVAC, also utilized a stored-program design using punched paper tape rather than electronic memory. The key difference between the von Neumann and Harvard architectures is that the latter separates the storage and treatment of CPU instructions and data, while the former uses the same memory space for both. Most modern CPUs are primarily von Neumann in design, but CPUs with the Harvard architecture are seen as well, especially in embedded applications; for instance, the Atmel AVR microcontrollers are Harvard architecture processors. The design complexity of CPUs increased as various technologies facilitated building smaller and more reliable electronic devices. The first such improvement came with the advent of the transistor. Transistorized CPUs during the 1950s and 1960s no longer had to be built out of bulky, unreliable, and fragile switching elements like vacuum tubes and relays. With this improvement more complex and reliable CPUs were built onto one or several printed circuit boards containing discrete (individual) components. In 1964, IBM introduced its System/360 computer architecture that was used in a series of computers capable of running the same programs with different speed and performance. This was significant at a time when most electronic computers were incompatible with one another, even those made by the same manufacturer. To facilitate this improvement, IBM utilized the concept of a microprogram (often called "microcode"), which still sees widespread usage in modern CPUs. The System/360 architecture was so popular that it dominated the mainframe computer market for decades and left a legacy that is still continued by similar modern computers like the IBM zSeries. In 1965, Digital Equipment Corporation (DEC) introduced another influential computer aimed at the scientific and research markets, the PDP-8. Transistor-based computers had several distinct advantages over their predecessors. Aside from facilitating increased reliability and lower power consumption, transistors also allowed CPUs to operate at much higher speeds because of the short switching time of a transistor in comparison to a tube or relay. Thanks to both the increased reliability as well as the dramatically increased speed of the switching elements (which were almost exclusively transistors by this time), CPU clock rates in the tens of megahertz were obtained during this period. Additionally while discrete transistor and IC CPUs were in heavy usage, new high-performance designs like SIMD (Single Instruction Multiple Data) vector processors began to appear. These early experimental designs later gave rise to the era of specialized supercomputers like those made by Cray Inc and Fujitsu Ltd.
CPU, core memory, and external bus interface of a DEC PDP-8/I. Made of medium-scale integrated circuits. During this period, a method of manufacturing many interconnected transistors in a compact space was developed. The integrated circuit (IC) allowed a large number of transistors to be manufactured on a single semiconductor-based die, or "chip". At first only very basic non-specialized digital circuits such as NOR gates were miniaturized into ICs. CPUs based upon these "building block" ICs are generally referred to as "small-scale integration" (SSI) devices. SSI ICs, such as the ones used in the Apollo guidance computer, usually contained up to a few score transistors. To build an entire CPU out of SSI ICs required thousands of individual chips, but still consumed much less space and power than earlier discrete transistor designs. IBM's System/370 follow-on to the System/360 used SSI ICs rather than Solid Logic Technology discrete-transistor modules. DEC's PDP-8/I and KI10 PDP-10 also switched from the individual transistors used by the PDP-8 and PDP-10 to SSI ICs, and their extremely popular PDP-11 line was originally built with SSI ICs but was eventually implemented with LSI components once these became practical. Lee Boysel published influential articles, including a 1967 "manifesto", which described how to build the equivalent of a 32-bit mainframe computer from a relatively small number of large-scale integration circuits (LSI). At the time, the only way to build LSI chips, which are chips with a hundred or more gates, was to build them using a MOS process (i.e., PMOS logic, NMOS logic, or CMOS logic). However, some companies continued to build processors out of bipolar chips because bipolar junction transistors were so much faster than MOS chips; for example, Datapoint built processors out of TTL chips until the early 1980s. People building high-speed computers wanted them to be fast, so in the 1970s they built the CPUs from small-scale integration (SSI) and medium-scale integration (MSI) 7400 series TTL gates. At the time, MOS ICs were so slow that they were considered useful only in a few niche applications that required low power. As the microelectronic technology advanced, an increasing number of transistors were placed on ICs, decreasing the quantity of individual ICs needed for a complete CPU. MSI and LSI ICs increased transistor counts to hundreds, and then thousands. By 1968, the number of ICs required to build a complete CPU had been reduced to 24 ICs of eight different types, with each IC containing roughly 1000 MOSFETs. In stark contrast with its SSI and MSI predecessors, the first LSI implementation of the PDP-11 contained a CPU composed of only four LSI integrated circuits. In the 1970s, the fundamental inventions by Federico Faggin (Silicon Gate MOS ICs with self-aligned gates along with his new random logic design methodology) changed the design and implementation of CPUs forever. 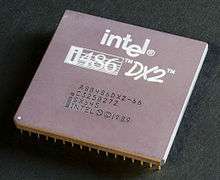 Since the introduction of the first commercially available microprocessor (the Intel 4004) in 1970, and the first widely used microprocessor (the Intel 8080) in 1974, this class of CPUs has almost completely overtaken all other central processing unit implementation methods. Mainframe and minicomputer manufacturers of the time launched proprietary IC development programs to upgrade their older computer architectures, and eventually produced instruction set compatible microprocessors that were backward-compatible with their older hardware and software. 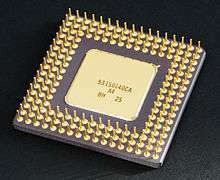 Combined with the advent and eventual success of the ubiquitous personal computer, the term CPU is now applied almost exclusively[lower-alpha 1] to microprocessors. Several CPUs (denoted cores) can be combined in a single processing chip. Previous generations of CPUs were implemented as discrete components and numerous small integrated circuits (ICs) on one or more circuit boards. Microprocessors, on the other hand, are CPUs manufactured on a very small number of ICs; usually just one. The overall smaller CPU size, as a result of being implemented on a single die, means faster switching time because of physical factors like decreased gate parasitic capacitance. This has allowed synchronous microprocessors to have clock rates ranging from tens of megahertz to several gigahertz. Additionally, as the ability to construct exceedingly small transistors on an IC has increased, the complexity and number of transistors in a single CPU has increased many fold. This widely observed trend is described by Moore's law, which has proven to be a fairly accurate predictor of the growth of CPU (and other IC) complexity. While the complexity, size, construction, and general form of CPUs have changed enormously since 1950, it is notable that the basic design and function has not changed much at all. Almost all common CPUs today can be very accurately described as von Neumann stored-program machines. [lower-alpha 2] As the aforementioned Moore's law continues to hold true, concerns have arisen about the limits of integrated circuit transistor technology. Extreme miniaturization of electronic gates is causing the effects of phenomena like electromigration and subthreshold leakage to become much more significant. These newer concerns are among the many factors causing researchers to investigate new methods of computing such as the quantum computer, as well as to expand the usage of parallelism and other methods that extend the usefulness of the classical von Neumann model. After the execution of an instruction, the entire process repeats, with the next instruction cycle normally fetching the next-in-sequence instruction because of the incremented value in the program counter. If a jump instruction was executed, the program counter will be modified to contain the address of the instruction that was jumped to and program execution continues normally. In more complex CPUs, multiple instructions can be fetched, decoded, and executed simultaneously. This section describes what is generally referred to as the "classic RISC pipeline", which is quite common among the simple CPUs used in many electronic devices (often called microcontroller). It largely ignores the important role of CPU cache, and therefore the access stage of the pipeline. Some instructions manipulate the program counter rather than producing result data directly; such instructions are generally called "jumps" and facilitate program behavior like loops, conditional program execution (through the use of a conditional jump), and existence of functions. [lower-alpha 3] In some processors, some other instructions change the state of bits in a "flags" register. These flags can be used to influence how a program behaves, since they often indicate the outcome of various operations. 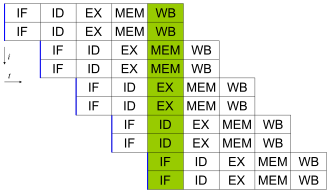 For example, in such processors a "compare" instruction evaluates two values and sets or clears bits in the flags register to indicate which one is greater or whether they are equal; one of these flags could then be used by a later jump instruction to determine program flow. The first step, fetch, involves retrieving an instruction (which is represented by a number or sequence of numbers) from program memory. The instruction's location (address) in program memory is determined by a program counter (PC), which stores a number that identifies the address of the next instruction to be fetched. After an instruction is fetched, the PC is incremented by the length of the instruction so that it will contain the address of the next instruction in the sequence. [lower-alpha 4] Often, the instruction to be fetched must be retrieved from relatively slow memory, causing the CPU to stall while waiting for the instruction to be returned. This issue is largely addressed in modern processors by caches and pipeline architectures (see below). The way in which the instruction is interpreted is defined by the CPU's instruction set architecture (ISA). [lower-alpha 5] Often, one group of bits (that is, a "field") within the instruction, called the opcode, indicates which operation is to be performed, while the remaining fields usually provide supplemental information required for the operation, such as the operands. Those operands may be specified as a constant value (called an immediate value), or as the location of a value that may be a processor register or a memory address, as determined by some addressing mode. Most high-end microprocessors (in desktop, laptop, server computers) have a memory management unit, translating logical addresses into physical RAM addresses, providing memory protection and paging abilities, useful for virtual memory. Simpler processors, especially microcontrollers usually don't include an MMU. One method of dealing with the switching of unneeded components is called clock gating, which involves turning off the clock signal to unneeded components (effectively disabling them). However, this is often regarded as difficult to implement and therefore does not see common usage outside of very low-power designs. One notable recent CPU design that uses extensive clock gating is the IBM PowerPC-based Xenon used in the Xbox 360; that way, power requirements of the Xbox 360 are greatly reduced. Another method of addressing some of the problems with a global clock signal is the removal of the clock signal altogether. While removing the global clock signal makes the design process considerably more complex in many ways, asynchronous (or clockless) designs carry marked advantages in power consumption and heat dissipation in comparison with similar synchronous designs. While somewhat uncommon, entire asynchronous CPUs have been built without utilizing a global clock signal. Two notable examples of this are the ARM compliant AMULET and the MIPS R3000 compatible MiniMIPS. Related to numeric representation is the size and precision of integer numbers that a CPU can represent. In the case of a binary CPU, this is measured by the number of bits (significant digits of a binary encoded integer) that the CPU can process in one operation, which is commonly called "word size", "bit width", "data path width", "integer precision", or "integer size". A CPU's integer size determines the range of integer values it can directly operate on. [lower-alpha 7] For example, an 8-bit CPU can directly manipulate integers represented by eight bits, which have a range of 256 (28) discrete integer values. CPUs with larger word sizes require more circuitry and consequently are physically larger, cost more, and consume more power (and therefore generate more heat). As a result, smaller 4- or 8-bit microcontrollers are commonly used in modern applications even though CPUs with much larger word sizes (such as 16, 32, 64, even 128-bit) are available. When higher performance is required, however, the benefits of a larger word size (larger data ranges and address spaces) may outweigh the disadvantages. A CPU can have internal data paths shorter than the word size to reduce size and cost. For example, even though the IBM System/360 instruction set was a 32-bit instruction set, the System/360 Model 30 and Model 40 had 8-bit data paths in the arithmetic logical unit, so that a 32-bit add required four cycles, one for each 8 bits of the operands, and, even though the Motorola 68k instruction set was a 32-bit instruction set, the Motorola 68000 and Motorola 68010 had 16-bit data paths in the arithmetic logical unit, so that a 32-bit add required two cycles. Model of a subscalar CPU, in which it takes fifteen clock cycles to complete three instructions. Most of the difficulty in the design of a superscalar CPU architecture lies in creating an effective dispatcher. The dispatcher needs to be able to quickly and correctly determine whether instructions can be executed in parallel, as well as dispatch them in such a way as to keep as many execution units busy as possible. This requires that the instruction pipeline is filled as often as possible and gives rise to the need in superscalar architectures for significant amounts of CPU cache. It also makes hazard-avoiding techniques like branch prediction, speculative execution, and out-of-order execution crucial to maintaining high levels of performance. By attempting to predict which branch (or path) a conditional instruction will take, the CPU can minimize the number of times that the entire pipeline must wait until a conditional instruction is completed. Speculative execution often provides modest performance increases by executing portions of code that may not be needed after a conditional operation completes. Out-of-order execution somewhat rearranges the order in which instructions are executed to reduce delays due to data dependencies. Also in case of single instruction stream, multiple data stream—a case when a lot of data from the same type has to be processed—, modern processors can disable parts of the pipeline so that when a single instruction is executed many times, the CPU skips the fetch and decode phases and thus greatly increases performance on certain occasions, especially in highly monotonous program engines such as video creation software and photo processing. Both simple pipelining and superscalar design increase a CPU's ILP by allowing a single processor to complete execution of instructions at rates surpassing one instruction per clock cycle. [lower-alpha 9] Most modern CPU designs are at least somewhat superscalar, and nearly all general purpose CPUs designed in the last decade are superscalar. In later years some of the emphasis in designing high-ILP computers has been moved out of the CPU's hardware and into its software interface, or ISA. The strategy of the very long instruction word (VLIW) causes some ILP to become implied directly by the software, reducing the amount of work the CPU must perform to boost ILP and thereby reducing the design's complexity. This reversal of emphasis is evidenced by the proliferation of dual and more core processor designs and notably, Intel's newer designs resembling its less superscalar P6 architecture. Late designs in several processor families exhibit CMP, including the x86-64 Opteron and Athlon 64 X2, the SPARC UltraSPARC T1, IBM POWER4 and POWER5, as well as several video game console CPUs like the Xbox 360's triple-core PowerPC design, and the PS3's 7-core Cell microprocessor. A less common but increasingly important paradigm of processors (and indeed, computing in general) deals with data parallelism. The processors discussed earlier are all referred to as some type of scalar device. [lower-alpha 10] As the name implies, vector processors deal with multiple pieces of data in the context of one instruction. This contrasts with scalar processors, which deal with one piece of data for every instruction. Using Flynn's taxonomy, these two schemes of dealing with data are generally referred to as single instruction stream, multiple data stream (SIMD) and single instruction stream, single data stream (SISD), respectively. The great utility in creating processors that deal with vectors of data lies in optimizing tasks that tend to require the same operation (for example, a sum or a dot product) to be performed on a large set of data. Some classic examples of these types of tasks include multimedia applications (images, video, and sound), as well as many types of scientific and engineering tasks. Whereas a scalar processor must complete the entire process of fetching, decoding, and executing each instruction and value in a set of data, a vector processor can perform a single operation on a comparatively large set of data with one instruction. Of course, this is only possible when the application tends to require many steps which apply one operation to a large set of data. A host is the virtual equivalent of a physical machine, on which a virtual system is operating. When there are several physical machines operating in tandem and managed as a whole, the grouped computing and memory resources form a cluster. In some systems it is possible to dynamically add and remove from a cluster. Resources available at a host and cluster level can be partitioned out into resources pools with fine granularity. The performance or speed of a processor depends on, among many other factors, the clock rate (generally given in multiples of hertz) and the instructions per clock (IPC), which together are the factors for the instructions per second (IPS) that the CPU can perform. Many reported IPS values have represented "peak" execution rates on artificial instruction sequences with few branches, whereas realistic workloads consist of a mix of instructions and applications, some of which take longer to execute than others. The performance of the memory hierarchy also greatly affects processor performance, an issue barely considered in MIPS calculations. Because of these problems, various standardized tests, often called "benchmarks" for this purpose—​​such as SPECint—​​have been developed to attempt to measure the real effective performance in commonly used applications. Due to specific capabilities of modern CPUs, such as hyper-threading and uncore, which involve sharing of actual CPU resources while aiming at increased utilization, monitoring performance levels and hardware utilization gradually became a more complex task. As a response, some CPUs implement additional hardware logic that monitors actual utilization of various parts of a CPU and provides various counters accessible to software; an example is Intel's Performance Counter Monitor technology. ↑ The so-called "von Neumann" memo expounded the idea of stored programs, which for example may be stored on punched cards, paper tape, or magnetic tape. ↑ Some early computers like the Harvard Mark I did not support any kind of "jump" instruction, effectively limiting the complexity of the programs they could run. It is largely for this reason that these computers are often not considered to contain a proper CPU, despite their close similarity to stored-program computers. ↑ Since the program counter counts memory addresses and not instructions, it is incremented by the number of memory units that the instruction word contains. In the case of simple fixed-length instruction word ISAs, this is always the same number. For example, a fixed-length 32-bit instruction word ISA that uses 8-bit memory words would always increment the PC by four (except in the case of jumps). ISAs that use variable-length instruction words increment the PC by the number of memory words corresponding to the last instruction's length. ↑ The physical concept of voltage is an analog one by nature, practically having an infinite range of possible values. For the purpose of physical representation of binary numbers, two specific ranges of voltages are defined, one for logic '0' and another for logic '1'. These ranges are dictated by design considerations such as noise margins and characteristics of the devices used to create the CPU. ↑ While a CPU's integer size sets a limit on integer ranges, this can (and often is) overcome using a combination of software and hardware techniques. By using additional memory, software can represent integers many magnitudes larger than the CPU can. Sometimes the CPU's instruction set will even facilitate operations on integers larger than it can natively represent by providing instructions to make large integer arithmetic relatively quick. This method of dealing with large integers is slower than utilizing a CPU with higher integer size, but is a reasonable trade-off in cases where natively supporting the full integer range needed would be cost-prohibitive. See Arbitrary-precision arithmetic for more details on purely software-supported arbitrary-sized integers. ↑ Neither ILP nor TLP is inherently superior over the other; they are simply different means by which to increase CPU parallelism. As such, they both have advantages and disadvantages, which are often determined by the type of software that the processor is intended to run. High-TLP CPUs are often used in applications that lend themselves well to being split up into numerous smaller applications, so-called "embarrassingly parallel problems". Frequently, a computational problem that can be solved quickly with high TLP design strategies like symmetric multiprocessing takes significantly more time on high ILP devices like superscalar CPUs, and vice versa. ↑ Best-case scenario (or peak) IPC rates in very superscalar architectures are difficult to maintain since it is impossible to keep the instruction pipeline filled all the time. Therefore, in highly superscalar CPUs, average sustained IPC is often discussed rather than peak IPC. ↑ Earlier the term scalar was used to compare the IPC count afforded by various ILP methods. Here the term is used in the strictly mathematical sense to contrast with vectors. See scalar (mathematics) and Vector (geometric). ↑ Although SSE/SSE2/SSE3 have superseded MMX in Intel's general-purpose processors, later IA-32 designs still support MMX. This is usually accomplished by providing most of the MMX functionality with the same hardware that supports the much more expansive SSE instruction sets. 1 2 Weik, Martin H. (1961). "A Third Survey of Domestic Electronic Digital Computing Systems". Ballistic Research Laboratory. ↑ Kuck, David (1978). Computers and Computations, Vol 1. John Wiley & Sons, Inc. p. 12. ISBN 0471027162. 1 2 Thomas Willhalm; Roman Dementiev; Patrick Fay (December 18, 2014). "Intel Performance Counter Monitor – A better way to measure CPU utilization". software.intel.com. Retrieved February 17, 2015. ↑ Regan, Gerard. A Brief History of Computing. p. 66. ISBN 1848000839. Retrieved 26 November 2014. ↑ "Bit By Bit". Haverford College. Archived from the original on October 13, 2012. Retrieved August 1, 2015. ↑ "First Draft of a Report on the EDVAC" (PDF). Moore School of Electrical Engineering, University of Pennsylvania. 1945. ↑ Stanford University. "The Modern History of Computing". The Stanford Encyclopedia of Philosophy. Retrieved September 25, 2015. ↑ "The Manchester Mark 1". The University of Manchester. Retrieved September 25, 2015. ↑ "The First Generation". Computer History Museum. Retrieved September 29, 2015. ↑ "The History of the Integrated Circuit". Nobelprize.org. Retrieved September 29, 2015. ↑ Turley, Jim. "Motoring with microprocessors". Embedded. Retrieved November 15, 2015. ↑ "Mobile Processor Guide – Summer 2013". Android Authority. Retrieved November 15, 2015. ↑ "ARM946 Processor". ARM. Retrieved November 15, 2015. ↑ "Konrad Zuse". Computer History Museum. Retrieved September 29, 2015. ↑ "Timeline of Computer History: Computers". Computer History Museum. Retrieved November 21, 2015. ↑ White, Stephen. "A Brief History of Computing - First Generation Computers". Retrieved November 21, 2015. ↑ "Harvard University Mark - Paper Tape Punch Unit". Computer History Museum. Retrieved November 21, 2015. ↑ "What is the difference between a von Neumann architecture and a Harvard architecture?". ARM. Retrieved November 22, 2015. ↑ "Advanced Architecture Optimizes the Atmel AVR CPU". Atmel. Retrieved November 22, 2015. ↑ "Switches, transistors and relays". BBC. Retrieved 7 February 2016. ↑ "Introducing the Vacuum Transistor: A Device Made of Nothing". IEEE Spectrum. Retrieved 7 February 2016. ↑ "What Is Computer Performance?". The National Academies Press. Retrieved May 16, 2016. ↑ "1953: Transistorized Computers Emerge". Computer History Museum. Retrieved June 3, 2016. ↑ "IBM System/360 Dates and Characteristics". IBM. 1 2 Amdahl, G. M.; Blaauw, G. A.; Brooks, F. P. Jr. (April 1964). "Architecture of the IBM System/360". IBM Journal of Research and Development. IBM. 8 (2): 87–101. doi:10.1147/rd.82.0087. ISSN 0018-8646. ↑ Brodkin, John. "50 years ago, IBM created mainframe that helped send men to the Moon". Ars Technica. Retrieved 9 April 2016. ↑ Clarke, Gavin. "Why won't you DIE? IBM's S/360 and its legacy at 50". The Register. Retrieved 9 April 2016. ↑ "Online PDP-8 Home Page, Run a PDP-8". PDP8. Retrieved September 25, 2015. ↑ "Transistors, Relays, and Controlling High-Current Loads". New York University. ITP Physical Computing. Retrieved 9 April 2016. ↑ Lilly, Paul. "A Brief History of CPUs: 31 Awesome Years of x86". PC Gamer. Retrieved June 15, 2016. ↑ Patterson, David A.; Hennessy, John L.; Larus, James R. (1999). Computer organization and design : the hardware/software interface (2. ed., 3rd print. ed.). San Francisco: Kaufmann. p. 751. ISBN 1558604286. ↑ Ross Knox Bassett. "To the Digital Age: Research Labs, Start-up Companies, and the Rise of MOS Technology". 2007. p. 127-128, 256, and 314. 1 2 Ken Shirriff. "The Texas Instruments TMX 1795: the first, forgotten microprocessor". ↑ T. J. Stonham. "Digital Logic Techniques: Principles and Practice". 1996. p. 174. ↑ "LSI-11 Module Descriptions". LSI-11, PDP-11/03 user's manual (PDF) (2nd ed.). Maynard, Massachusetts: Digital Equipment Corporation. November 1975. pp. 4–3. ↑ Margaret Rouse (March 27, 2007). "Definition: multi-core processor". TechTarget. Retrieved March 6, 2013. ↑ Richard Birkby. "A Brief History of the Microprocessor". computermuseum.li. Retrieved October 13, 2015. ↑ Osborne, Adam (1980). An Introduction to Microcomputers. Volume 1: Basic Concepts (2nd ed.). Berkeley, California: Osborne-McGraw Hill. ISBN 0-931988-34-9. ↑ Zhislina, Victoria. "Why has CPU frequency ceased to grow?". Intel. Retrieved October 14, 2015. ↑ "MOS Transistor - Electrical Engineering & Computer Science" (PDF). University of California. Retrieved October 14, 2015. 1 2 "Excerpts from A Conversation with Gordon Moore: Moore's Law" (PDF). Intel. 2005. Archived from the original (PDF) on 2012-10-29. Retrieved 2012-07-25. ↑ Lilly, Paul. "A Brief History of CPUs: 31 Awesome Years of x86". Maximum PC. Retrieved December 10, 2015. ↑ Aspray, William. "The stored program concept" (PDF). Spectrum, IEEE. Retrieved September 29, 2015. ↑ Ian Wienand (September 3, 2013). "Computer Science from the Bottom Up, Chapter 3. Computer Architecture" (PDF). bottomupcs.com. Retrieved January 7, 2015. ↑ Brown, Jeffery (2005). "Application-customized CPU design". IBM developerWorks. Retrieved 2005-12-17. ↑ Garside, J. D.; Furber, S. B.; Chung, S-H (1999). "AMULET3 Revealed". University of Manchester Computer Science Department. Archived from the original on December 10, 2005. ↑ "IBM System/360 Model 65 Functional Characteristics" (PDF). IBM. September 1968. pp. 8–9. A22-6884-3. ↑ Huynh, Jack (2003). "The AMD Athlon XP Processor with 512KB L2 Cache" (PDF). University of Illinois, Urbana-Champaign. pp. 6–11. Retrieved 2007-10-06. ↑ Gottlieb, Allan; Almasi, George S. (1989). Highly parallel computing. Redwood City, Calif.: Benjamin/Cummings. ISBN 0-8053-0177-1. ↑ Flynn, M. J. (September 1972). "Some Computer Organizations and Their Effectiveness". IEEE Trans. Comput. C–21 (9): 948–960. doi:10.1109/TC.1972.5009071. ↑ "Parallelism exploitation in superscalar multiprocessing" (PDF). IEEE Xplore. Retrieved 25 April 2016. ↑ Anjum, Bushra; Perros, Harry G. (2015). "1: Partitioning the End-to-End QoS Budget to Domains". Bandwidth Allocation for Video Under Quality of Service Constraints. Focus Series. John Wiley & Sons. p. 3. ISBN 9781848217461. Retrieved 2016-09-21. [...] in cloud computing where multiple software components run in a virtual environment on the same blade, one component per virtual machine (VM). Each VM is allocated a virtual central processing unit [...] which is a fraction of the blade's CPU. ↑ Fifield, Tom; Fleming, Diane; Gentle, Anne; Hochstein, Lorin; Proulx, Jonathan; Toews, Everett; Topjian, Joe (2014). "Glossary". OpenStack Operations Guide. Beijing: O'Reilly Media, Inc. p. 286. ISBN 9781491906309. Retrieved 2016-09-20. Virtual Central Processing Unit (vCPU)[:] Subdivides physical CPUs. Instances can then use those divisions. ↑ "VMware Infrastructure Architecture Overview- White Paper" (PDF). VMware. VMware. 2006. ↑ "CPU Frequency". CPU World Glossary. CPU World. 25 March 2008. Retrieved 1 January 2010. ↑ "What is (a) multi-core processor?". Data Center Definitions. SearchDataCenter.com. Retrieved 8 August 2016. ↑ "Quad Core Vs. Dual Core". Buzzle. Retrieved 26 November 2014. ↑ Tegtmeier, Martin. "CPU utilization of multi-threaded architectures explained". Oracle. Retrieved September 29, 2015.